Read Ron Simon's blog about Kovacs. Follow the live tweets @PaleyCenter on Twitter and use #ErnieKovacs #PaleyLiveNY to join the conversation! The Ernie Kovacs Collection is a treasure trove of highlights from television’s original genius, most of it unseen for over fifty years. 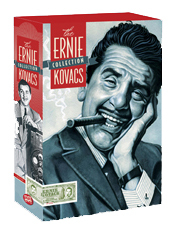 The Ernie Kovacs Collection contains six DVDs and over thirteen hours of content that span the all-too-brief but brilliant career in television of this hugely influential comic artist, from his earliest local morning shows in Philadelphia through his NBC prime time shows and the ABC specials that represented the peak of his offbeat humor and creative experimentation with the medium. Shout Factory will donate 25% of all sales to the Paley Center.